Located in the northwest of China, Ningxia Hui Autonomous Region covers an area of 66,400 square kilometers. The autonomous region is blessed with rich revolutionary tourism resources in addition to its long history of culture and magic natural landscapes. Early in the Ming (1368-1644) and Qing (1644-1911) dynasties, many armed uprisings against oppression burst in the region. After the outbreak of the Revolution of 1911 led by Dr. Sun Yat-sen, the Ningxia people responded to the call by overthrowing feudal ruling representatives in the region. Ningxia has two famed mountains, Helan Mountains in the northwest and Liupan Mountain in the south. The steep Helan Mountains, running north-south parallel to the north-flowing Yellow River, have been a natural barrier against the northern nomadic invasion since ancient times. The Liupanshan Mountains, also known as Longshan Mountains, stretches across Gansu Province and Ningxia Hui Autonomous Region, and Shanxi Province. In October 1935, the red army led by Mao Zedong went by the site during the Long March (1934-1936), a massive military retreat undertaken by the Red Army to evade the pursuit of the Kuomintang army. 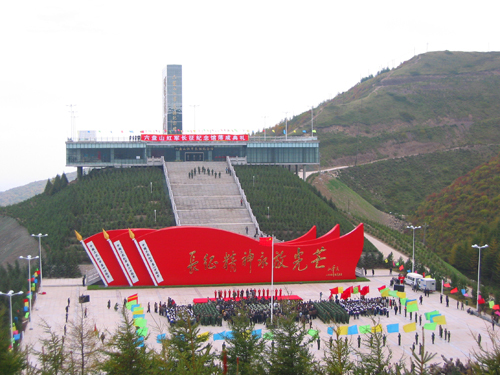 On top of the mountain in the region's Guyuan City is the Red Army Long March Museum rebuilt based on the former Long March Pavilion to celebrate the 70th anniversary of the Long March.